The debate over pylons rages across the country. People continue to have concerns about the effects on health from such pylons and the other side continue to say that no link has been proven. The debate will rage on. There is no doubt however that few people would be happy to have such electrical fields in close proximity to where they live. In recent days the Minister for Health James Reilly has been accused of a u-turn on pylons. He was also very concerned about the health effects of an interconnector running through his constituency. Indeed it would appear that the Minister and those close to him made every effort to ramp up opposition to such a development and had no problem listening to constituents concerns then. Indeed Rush Community Council even took a case against Eirgrid in order to try and halt the development. At the time Ann McCrudden, a prominent supporter of Mr Reilly was leading the charge for the community council. Indeed her sister in law will be the FG candidate for Rush in the upcoming local elections. Eirgrid wanted to take up part of the road leading to her house for the project and after she refused they went the route of a compulsory purchase order. Quite understandably Ms McCrudden used all means she could to stop eirgrid in this action. The good news for the community was that Eirgrid finally agreed to have an independent report carried out to look at the safety of the Interconnector project. A company called KEMA did this, but they found no health implications for the area. So surely this put James Reilly and others in the clear? They had done their bit and the case was proven? Alas, No, now this is where it gets really interesting. Rush Community Council even went to the high court to try and stop Eirgrid but they lost. There is no doubt however that many of Minister Reilly’s close supporters are opposed to such electrical projects and very definitely believe that they pose health risks. Minister Reilly did nothing to stop or dissuade anyone from such a campaign. It would be interesting to hear what Minister Reilly actually thinks of such a protest because either he doesn’t believe in the actions of the people who support him or he doesn’t believe in the actions of Eirgrid, the government and Minister Pat Rabbitte. All in all it just goes to prove that NIMBY is very much alive and well. Those pylons and electro magnetic fields are all fine just so long as they are affecting someone else. We have a habit of complaining about political interference. That is understandable really. Politicians often make a mess of things and abuse situations when they interfere. The Cahill plan to save Aer Lingus in the early nineties worked because it made the politicians back off and leave the running of the company to the people in the industry. We have had situations of phone tapping, we had a Minister for Justice and Communications that was determined to try and destroy RTE as he perceived them as biased. We had health boards that were run at the behest of politicians. We still have grave doubts over the locations of primary care centres after alleged political interference last year. One only has to mention the word ‘planning’ to make the whole nation heave a sigh and shake their head ruefully. The list of examples is and endless stream which helps convince us that political interference is never a good thing. Is that really the case though? I am convinced that there is a balance to be struck. The problem is that a bad politician will act in their own self interest and abuse a situation. At the same time we will suffer if good politicians become convinced that they should always steer clear. In the late ’90s it became fashionable to set up ‘independent bodies’. No matter where you looked there was another independent body springing up. The purpose of these was to create distance. Ministers were not to be held accountable and blamed for decisions, strikes, problems and activities. The Minister would simply become a conduit to ‘raise the matter’ with the appropriate people. The best example of this was the HSE, particularly under the stewardship of Minister Harney. It all seemed a good way to do business. I often thought it was the perfect example of the Bertie Ahern leadership style, where compromise and distance replaced decisiveness and speed. Procedures became more important than results. Now, the next step was of course the appointment of people to the boards. In an ideal world the idea of a minister making such appointments makes a lot of sense. The Minister should have a voice they can trust at the table. A person who will help to ensure that the elected governments views and objectives are always kept in mind. The reality was different. Instead of it being a job it became a reward. People were not appointed to one board they were appointed to several. No longer did these individuals see their role as somehow bringing something to the board or aiding in government plans, it was instead their reward for previous work done. Therefore getting something out of it was the main objective rather than seeing it as a new role where they had to prove themselves. On the other hand, Ministers gave out these roles and then quite happily distanced themselves from everything. If decisions were taken they did not want to know. After all you can’t be blamed for something you were never told about. We certainly do not know all the story as regards the banking crisis. However, all the evidence so far points in one direction. It was what I call the ‘golf club syndrome’. All the lads knew each other. Each one thought the other was a great guy. It allowed for groupthink to penetrate. If we all keep saying it it must be true. If there’s a rumour of an issue in a bank then we don’t haul them in or look for information. Instead, the Minister asked the Department Secretary over lunch, to talk to the Central Bank. The Central Bank has a chat with the Regulator when he pops in. The Regulator picks up the phone to the Banks CEO and asks if everything is OK. The CEO says it is. The message is relayed back and everyone is happy. Next item will be the banks invitation to a golf classic or a conference. Take them at their word. Don’t interfere; these guys know what they are doing. Charities and boards go wild on payments, retirement packages and top ups but nobody sees a reason to mention it at the time. Worse, no politician sees a reason for them to be questioning such things as guardians of the tax payer. They don’t want to know. The less you know the less you can be blamed for. Irish Water is the latest in this line with its raft of consultants and its laughing yoga. Minister Hogan told everyone that he doesn’t ‘micro mange’. Of course not. The best escape any minister can have is to ‘know nothing of this matter’ and to be ‘appalled when it was brought to my attention’. Not once did anyone think that in such a vital project that Ministers needed to interfere a bit by asking questions, demanding reports and ensuring satisfactory answers. It is quite clear that there are politicians who abuse their power and that will never change. We must simply guard against it. Always question their motives and ask them for answers. It should not be a reason for politicians to back away from decisions and responsibility. When they do we can see that other people are equally capable of abusing a situation, and they carry on using public money with absolutely no concept of public accountability. Such people also lack any kind of judgment when it comes to public opinion and seem completely disconnected from the lives of everyday people. Perhaps before taking up any such role we should ask an individual to spend 6 months on the dole just to let them understand why value for money is important. In any event we must strive for a balance. Where politicians abuse their power we must ensure it is reported and uncovered. We must also demand that politicians stop abdicating their responsibility as protectors of the public and start demanding answers and actions rather than throwing their hands in the air and sighing with the rest of us helpless sods. Who cares about those who care? Last October we took the difficult decision to place my Dad in a nursing home. He has been ill for many years and yet another stroke made it all but impossible for us to care for him at home. Trying to look at it logically it was the only decision open to us. I like logic. Emotion is far less of a friend. No matter how many people agree with the decision, friends and professionals, the fact that he is now in a nursing home is an emotional scar. The home itself seems excellent, the standard of care is high and the staff are lovely. That helps. Yet I find myself visiting him and he still cries about missing home. In this recession everyone knows business is tough, I flit from place to place and meeting to meeting chasing work everywhere to keep my own family afloat. Between these meetings I try to visit him when I can. Just the other day he cried and said ‘Please don’t go…’ . That was tough. He was the man who collected me from every place I ever ended up, every time I had no lift, every time I got stranded or any time I felt alone and just needed to get home. Life can be very cruel. Those who act in the role of carer do an amazing job. It is a 24/7 responsibility, its stressful and demanding. All across our country we have people doing it. Parents who look after disabled children, spouses or family members looking after an elderly relative or care workers who come in for a few hours to help. My Dad would have been in a nursing home many years ago were people not willing to give up so much to care for him and keep him at home for as long as we could. Thousands of people manage to live out their days in the comfort and peace of their own home thanks to a sacrifice by others. It is a good thing to see in a society. However, aren’t we used to good things costing us a lot of money? Well, that’s just it, these carers are not costing us money, not only are they managing to help improve the lot of those they care for but they save the state hundreds of millions of euro by ensuring that people are not placed in expensive full time care. It is a classic case of a win win scenario. The state saves money, the people are happy and everything works out………so why is it not that simple? Why is it that successive ministers pay lip service to the idea of homecare and yet fail to deliver? Why is it that we say the aim is that more people will be able to stay in their own homes but then do the opposite? The real problem is how we view Carers. We pay them €204 per week. That’s fine but it takes no account of the hours worked, the fact that it is often at times when any other job would be getting overtime rates and so forth and it is nothing in comparison to what is being saved. All you need to know is apparent from the budget we pay it out of. It’s not the health budget it’s the Social welfare budget. Why? because it’s not a job, its seen as a welfare benefit. Carers are not employed workers doing a job on behalf of the state they are instead seen as people benefiting from state payments. Now, in our own case it was my father’s ill health that led to him going into full time care but increasing budgetary strain is placing many families in a situation where they will be forced to reconsider home care. The Department will tell you that they will change the means test and increase the budget. This again ignores the long term saving to the state in the hope of making a quick budget buck. It is based on the premise that people will not flood the nursing homes, if they thought that would happen there would be no cut at all. No, it’s a calculated gamble that families will sacrifice even more to help their loved ones stay at home. We say that we understand the economics of it, we say that keeping people at home makes sense and we say that these people are saving the state a fortune. Then we cut the respite care grant, we cut the home help hours, and we cut the amount of people eligible for housing adaptation grants. This at a time when we are offering all kinds of other incentives in areas for people to get construction work done and houses made more efficient. However the construction and home improvement work involved in housing adaptation was not seen as such a ‘stimulus’. No, because it’s just another benefit. In a world where executives get ‘top up payments’ and bonuses that would make any fair person blush, we say that if a carer were to double their workload and care for two people they don’t get double the allowance they get 1.5 carers allowance. How’s that for salary efficiency? I don’t blame the politicians to be honest. They just follow what seems to be the advice within their departments and take the path of least resistance. Nothing new there. Bigger fish to fry. I do however blame the people who are supposed to be experts working within these departments who can see the figures but just don’t like accepting them. What kind of society are we, if the sick, elderly and disabled are seen as just a drain on resources? There can be no planning for the future if this is the road we set ourselves. It’s a future we all face and let me tell you now, it looks bleak. Who is going to say enough? Where do we draw the line? When are we going to start caring about those who care? It’s always a dangerous business to try and predict anything in politics, but we can be sure that everyone involved in the game is doing just that. Planning is everything in politics and it’s something that leader’s value highly. Even if plans go awry it’s still important to have them. The biggest threats are of course the ‘little things’ that trip you up. The question asked on some otherwise perfectly mundane Tuesday afternoon where you just get the words all wrong and cause a storm. The sudden revelation in a newspaper headline. The crisis that develops around something you think is perfectly fine but doesn’t look that way to anyone else. These are things we cannot predict and will be the biggest problems any government or political party will face. However as the New Year approaches there are 10 key items that all parties need to plan for and that they know are coming down the tracks. 1. Exchequer Returns – From about April onwards these need to be watched closely. The budget is a very tight one. In previous years during this crisis governments tried to sail close to the wind and it back fired. The early returns can be explained away and there are always changes as the year progresses. Previous years have taught us that from April onwards Departments start to worry and cracks start to appear. Ministers’ answers to questions start to sound less assured. However, if all is going to plan and the figures are holding up then this will be an incredibly good sign for the government particularly ahead of the local elections in June. 2. Bond Markets – Ireland does not need to borrow this year but it would be wise to hold some bond sales while we are fully funded rather than waiting until funds are nearly out. The government has a nice back stop of cash and should use this to test the waters of the markets. All eyes will be on the bond markets particularly in the second half of the year. If rates remain stable then the idea of leaving the bailout without any safety net will seem a very shrewd one. If however rates start to rise there will be a lot of nervous faces knocking about the halls of the Department of Finance. 3. The Taxation Argument – Ireland is likely to embark on another great taxation debate. For several years there has been a push to see higher earners pay more tax and to close loopholes to corporations. It is fair to say that this argument was decisively lost. Anyone in government who supported it was on the receiving end of a thumping. The government has no intention of touching income tax, particularly for high earners. Some Corporate tax loopholes are being looked at but it won’t be too scary. The debate is going to change. The side in the ascendency believes in lowering tax rates and having successfully stopped any rise they are set to seek a lowering as a way to encourage employment. The argument is one that is well familiar. It was used heavily from 1996-2007. This argument saw taxes lowered to an incredibly narrow base but one can expect that its return will see rates fall even more at the first sign of life in the economy and the first whiff of an election. 4. Public Sector Reform – Since the troika have at least left Ireland in terms of a visible presence there is a worry about the pace of reform. The government needs to ensure it meets targets and delivers an efficient value for money service. It also needs to rehabilitate the entire public service in terms of its image of customer service but that is likely to be put on the long finger. If economic news improves then the government will come under increasing pressure to halt cuts and some of the more drastic changes to contracts etc. These will not be easy to navigate. Reform has occurred under the cloud of doom that hung over the economy. While some economic success is good news it is also a double edged sword for the government in terms of its overall pace of reform. They say being in government is hard when there are no options. It can be even harder when there are options. 5. Political Reform – To be honest the man in the street is not anywhere near as worried about this as some think. However, it is a subject that people like to get stuck into. We have not seen huge reform from the government, lots of window dressing, but nothing that will really change the perspective of people. The abolition of the Seanad was the ‘big idea’. That wasn’t really reform but it was meant to tick a box. The government now seem to have decided that they are not going to do anything with the Seanad; it’s going to be ignored. That will teach people a lesson. Unfortunately, the people might not be too impressed. Within government circles there is an argument that the people were fooled by the no side into believing that they were voting for reform and that they will now teach them a lesson. This of course is a misreading of the situation. The people were not fooled; they simply didn’t think the government had the right to dictate their only options. That’s why the government lost that referendum and they long they try to continue to dictate the options the more it will annoy the populace. 6. Gay Marriage – This is one of those events that should not really cause the problems that it probably will. In all honesty the abortion debate last year should make this one easier as it is not as complex a moral argument. However, it is the abortion debate last year that is going to cause the problems here. The issue is one which most people will probably have no difficulty with and not see as a major issue. In politics however the conservatives who didn’t spit off from the government and who got a bloody nose on the abortion issue feel they have swallowed their pride enough. They will tell Labour that they will have to wait on this issue. 7. Health and James Reilly – Since the government took office I have always said that what happens in Health could be the make or break issue outside of economics for the parties. I see no reason to change. The system is still suffering huge difficulties with more cuts to come. Even when it had lots of money the system wasn’t working right. The small attempts at change have only left us with a system that’s a bit of this and a bit of that. The government needs to decide if it’s going to follow through on the health system they envisaged at the time of the last election. If so they cannot afford to allow the current mix and match approach continue, big changes need to happen fast. Big changes that will upset a lot of groups and individuals. 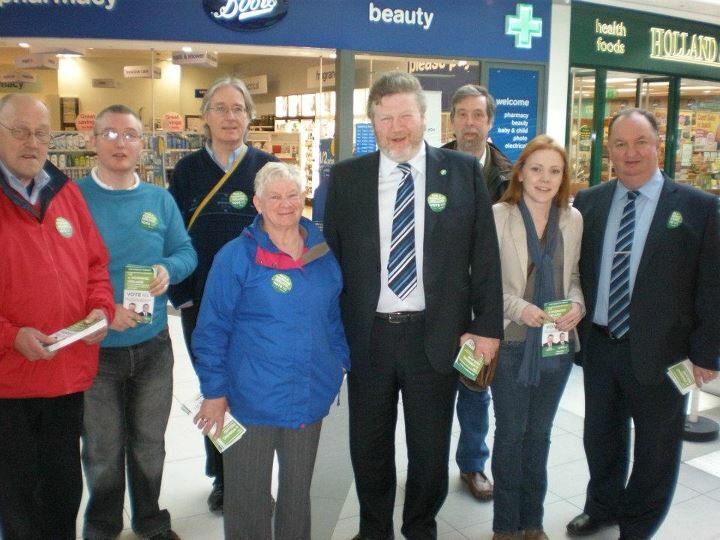 If they decide to abandon those plans it spells disaster for James Reilly. If they decide to implement them they must ask if his stock is high enough to face down the storms such change will cause. There may be merit in letting him take lots of flak and pushing ahead until June and then letting a new face take over and try to implement things. 8. Local & European elections – It goes without saying that these are the barometer for all parties. Can the government hold what they have at local level? Will FF recover to the mid-20s mark that they need to hold what they have? Will SF and Independents see a marked rise in support? There are many key battles that will be examined closer to the day but the mood of the country come next May will be pivotal for all. Right now the government needs to avoid any scandals and keep those figures on course. The opposition need to rethink their much divided strategies or find themselves struggling to make the impact they need. 9. European Negotiations – Europe will again figure highly on the radar. With a new German government comes a chance for the continent to rethink its future. Britain will be stepping up the pressure ahead of their own referendum which will want to see them in a more influential role. Greece and Portugal still have a lot of talking to do and Ireland may be the poster boy but everyone knows that Europe itself is failing to grow. Europe cannot grow unless the Germans have a working market; they can’t have a working market while everyone else in it is broke. There are a lot of negotiations to come that will decide the future direction of the EU and whether it’s Ireland or Greece looking for a deal, somebody is going to have to give. 10. Unemployment – 2013 was a good year in terms of positive jobs news. It’s still fragile though. 2014 is the big test. This is the year where the government may really eat into the unemployment figure. It has a good base from last year and needs to ensure that the jobs keep coming. This argument could be the trump card. Once you say you are reducing unemployment people tend to like you. It also means that those who are in jobs start to become less fearful of losing them and more willing to spend. That’s a good thing. The government has talked a lot about jobs and strategies. They have bet heavily on it. If it works then the public will be impressed. If it fails or if unemployment doesn’t continue to fall there could be trouble. Right now though things seem promising. Brexit: a sign in the Eurovision tea leaves? maybe.